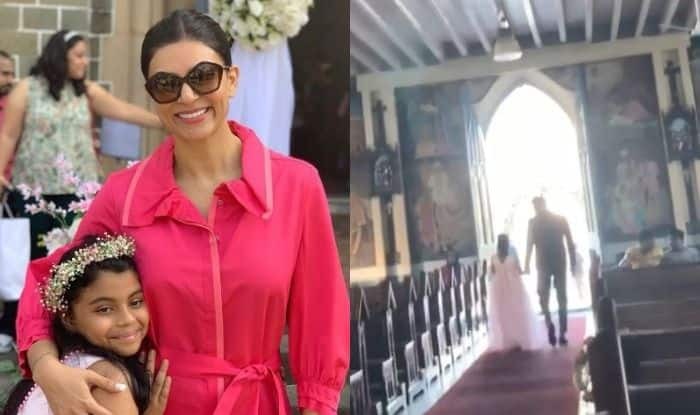 Sushmita's daughter Alisah practicing flower girl walk with Rohman is too adorable. Actress Sushmita Sen recently attended the wedding of her friend with beau Rohman Shawl and daughter Alisah. She shared many wonderful pictures and videos from the ceremony. Her daughter was one of the flower girls and looked pretty in a pink gown. In fact, in a video, Alisah was seen practicing her flower girl walk with Rohman. There is no denying the fact that Sushmita’s beau shares a great bond with his daughters. Rohman looked dapper and Sushmita donned a beautiful pink dress. The actress beamed with happiness as she posed with everyone. Sushmita and Rohman have been dating for quite some time. From walking hand-in-hand to sharing adorable posts for each other, their PDA always makes headlines. Speculations were rife that both of them are planning to take wedding vows. However, Sushmita has refuted these reports. Along with being a fantastic actress, Sushmita is also a wonderful mother. She is always seen appreciating her daughters to follow their dreams. The actress has many times broken stereotypes.